The immortal words by Luke Skywalker’s greatest student, and greatest failure. 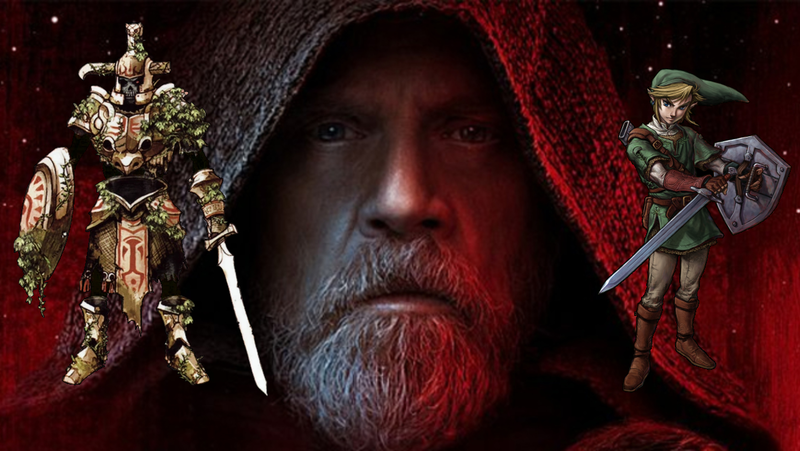 I’m all about finding neat little correlations to The Legend of Zelda series where people might not think to look, so in this post we’re gonna take a look at two very different, yet strikingly similar, mentors from two different galaxies: Luke Skywalker and the Hero’s Shade. At a glance, the similarities may not be obvious, but they’re there. Both embarked on an incredible mission and lived on; both are alone now in present day, isolated from the world, full of regret; Both men represented the pinnacle of what it meant to be a warrior, but when the time came, couldn’t properly pass along their knowledge to the newer generation. While it’s never explicitly stated that Shade tried and failed to find an apprentice (though what a side story that would be), we all now know of Luke’s failings to mentor the amazingly Force sensitive Ben Solo to carry the Jedi into the next generation. Not only did his failure to mentor Ben lead to the destruction of the newer generation of Jedi, but it gave rise to the galaxies most sinister threat: Kylo Ren. At the beginning of both Twilight Princess and The Force Awakens, the world seems normal… for a time. We then realize through Link that an invasion is imminent by the mysterious Twilight Realm, a strange force which seems to be engulfing Hyrule bit by bit. Likewise, in a galaxy far, far away, things appear to have settled down… until we are told from the ashes if the Galactic Empire, a new oppressive evil has arose: the First Order, with Kylo Ren as it’s leading foot soldier. Our new hero’s Rey, Finn, and Poe have to work together to bring peace back to the universe. It’s here that Shade and Luke start to differ a little bit. Whereas Luke had tried and failed to pass along his talents, Shade had never had the opportunity to even try, leaving him to die wondering ‘what if?’. When it seems Destiny has finally brought him a worthy apprentice, Shade actively seeks out, this generation’s newest Link., giving him the tools he needs to defeat evil – indeed, the final blow in the final battle is a skill taught by the Hero’s Shade. Through the course of Twilight Princess, the Hero’s Shade teaches his pupil all he knows, and can finally rest easy knowing that his pupil has taken his mantle and will use it to fight Ganondorf – the same evil being who Shade fought before, but couldn’t finish off. Compare this to Luke, and it’s almost night and day. Skywalker is a haunted man, a shell of his former shelf, humbled by his failures. After giving in to a moment of weakness and trying to murder his pupil after sensing darkness in him, Luke lives in isolation, throwing away the hope he brings to the galaxy, now left wondering if things could have been different if he hadn’t given up on Ben. When Rey finally finds him, he rejects her, believing that the ways of the Jedi are best left in the ruins of his fallen temple. Deep down, Skywalker does still have hope though, so after some persuasion, he agrees to train Rey and ends up facing his failure head on in a dramatic final confrontation with Kylo Ren. As an aside, on a meta level, it’s really interesting to compare the two entries into their relative franchises too. 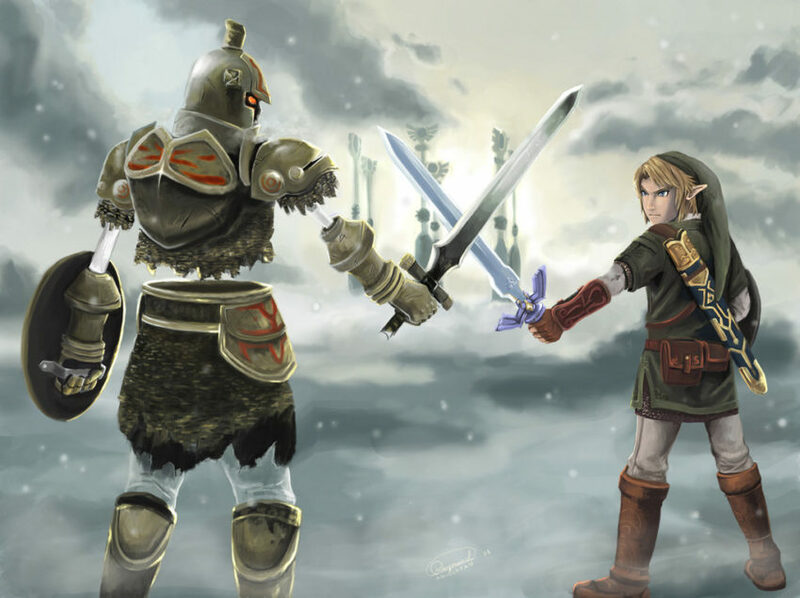 Twilight Princess and The Last Jedi were both met with praise from critics, but as the years have passed, there seems to be a large section of Zelda fans that became disenfranchised with Twilight Princess and write it off as a weak Zelda game. 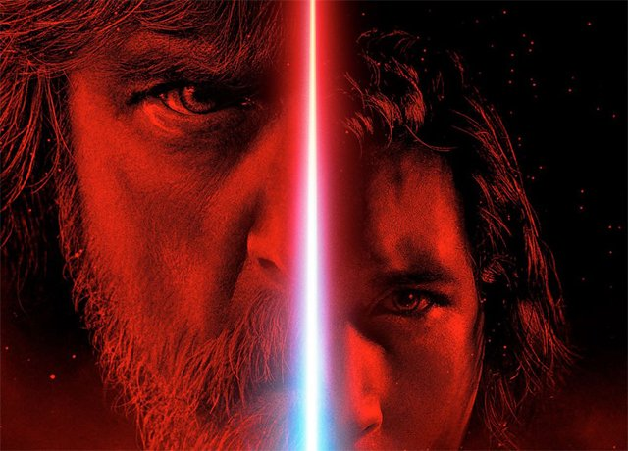 Meanwhile, the current controversy surrounding The Last Jedi and how it has (or hasn’t) struck a cord with Star Wars fans will probably always ensure that it’s a… divisive movie, to put it lightly. In the end, both the Hero’s Shade and Luke Skywalker are redeemed for their failures through the actions of their students – Link and Rey. Both lived a life full of regret, and both let their spirits willingly fade away after their purpose was fulfilled. Both seem to be worlds apart from each other, but the great, reoccurring theme of fiction comes into play again, proving great characters can be similar, no matter how different they may seem. Let me know what you think! Are there any other similarities between Zelda and Star Wars? Any other themes this two franchises have in common? Sound off in the comments below! Andy Spiteri is a Managing Editor at Zelda Dungeon. He’s currently playing Knight of the Old Republic cause he’s in a Star Wars mood. Follow him on Twitter here.